Parenting has never been an easy job and some would argue that parenting today is tougher than ever. But imagine being a mother in Canberra in the early 1900s, without the range of support and facilities we enjoy today. These mothers did not enjoy access to excellent modern health care, public sanitation, a huge variety of fresh foods, high quality early childhood education and a world of parenting information at their fingertips. 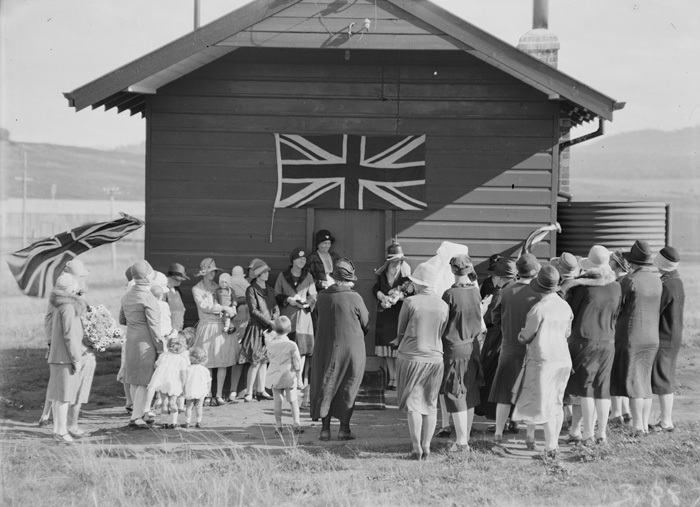 From 1920 to 1930, Canberra’s population more than quadrupled. As Canberra began to grow, so too did the interest in community health and welfare services. Across Australia there was an eagerness to develop more support for new mothers, with a focus on maternal and infant welfare, particularly once mothers left hospital. Of key interest, was the establishment of infant welfare centres and the desire for every family of a newborn baby to be offered a home visit by a suitably qualified nurse. From these early ideas grew an organisation that would significantly improve the lives of Canberra’s mothers and their children and go on to become the longest continuing health service provider in the ACT. 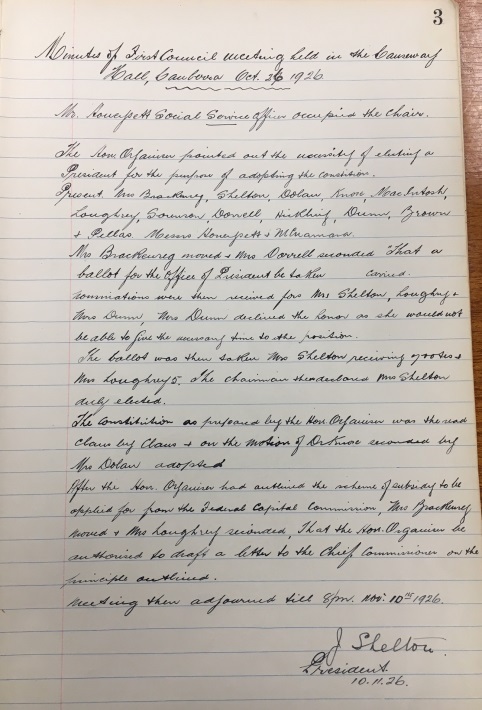 Records relating to the Canberra Mothercraft Society are ArchivesACT’s July Find of the Month. In the mid-1920s Canberra welcomed an influx of workmen employed by the Federal Capital Commission. 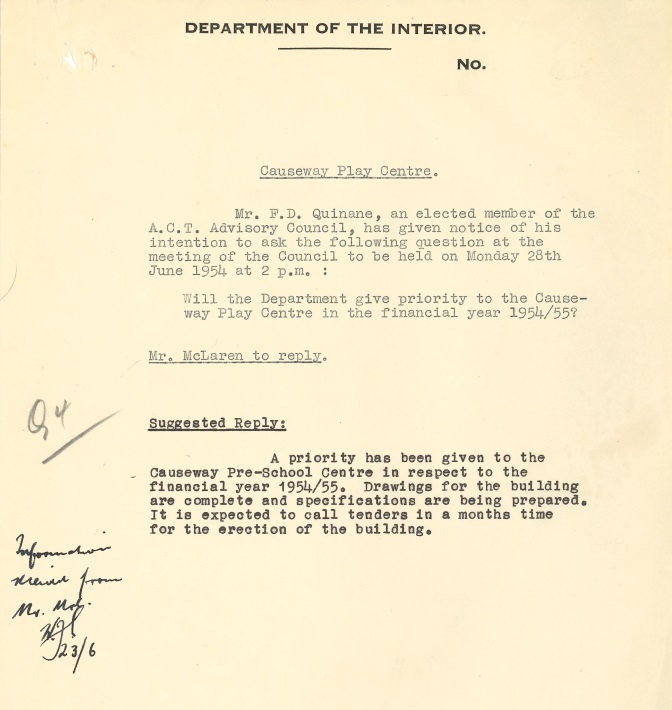 The FCC, were keen to improve the welfare conditions among its workmen and their families and, established a number of committees to explore ideas. 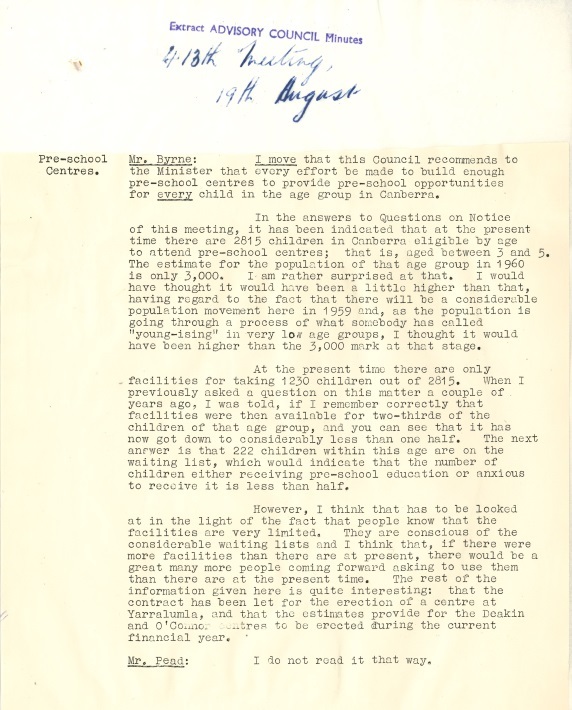 Chairman Sir John Butters suggested one committee should be dedicated to women’s and children’s welfare. Unfortunately no women had actually been invited to attend the meeting, so the male board nominated several women in absentia to form the committee. By April 1926, the committee reported their intention to focus on “clinics, lectures for mothers, and other activities of interest to housewives”. By October 1926, the push for services was largely driven by the Ainslie Social Service Association and its Secretary Mr Percy McNamara. McNamara was motivated by the plight of the wives and children of working men and stated “We have no maternity hospital here in the Federal Capital Territory, and the working class women suffer accordingly for the want of a qualified service”. 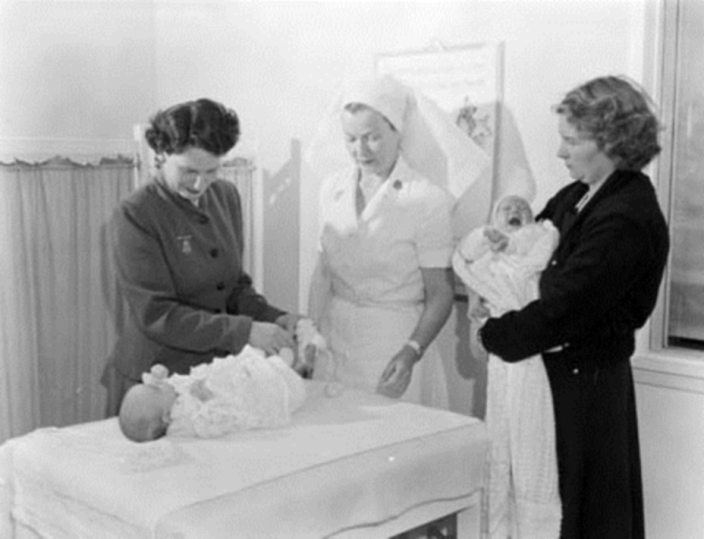 With support from his colleagues, and those prominent in maternal and child welfare services, particularly Mrs A.M. Norton who had travelled to Canberra to speak at “splendidly attended meetings” at Ainslie Hostel, Causeway Hall and Molonglo on behalf of the Royal Society for the Welfare of Mothers and Babies NSW, an agreement was made to establish a clinic to provide advice to mothers. The FCC would provide a venue and funding for a nurse for 2 years. She would be trained in infant hygiene, mothercraft and obstetric work. 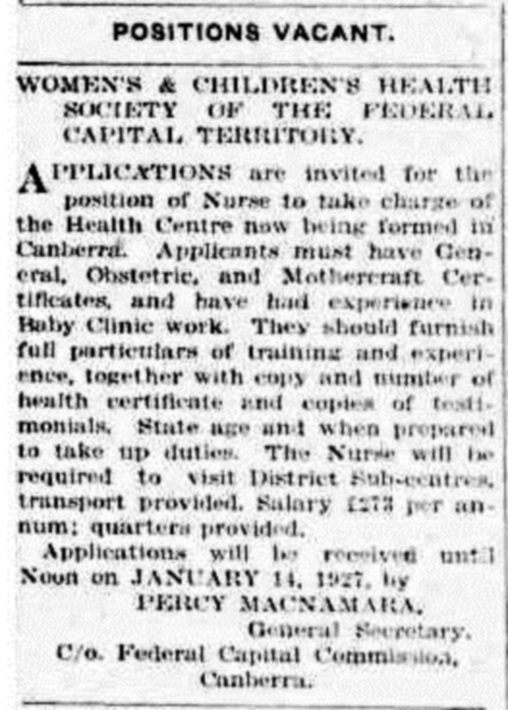 And so in October 1926, a meeting of the District Councils of the Child Welfare Movement was held with the decision made to name the movement the WomensWomen’s and Infants Welfare Society of the Federal Capital Territory (although minutes from the first meeting record the name as the WomensWomen’s and Infants Health Society Canberra and Federal Capital Territory). Mrs J. Shelton was elected as President and a constitution was drafted, with a focus on the health aspects of maternal and child welfare. Less than 3 months later, the Society formally changed its name to The Canberra Mothercraft Society. At a special general meeting held at Acton Hall in February 1926, noted as “one of the largest gatherings of women ever seen in Canberra”, Mrs Doris Duffield, wife of the inaugural Director of the Commonwealth Solar Observatory Walter Duffield, was elected as President. In February 1927, Sister Ella Whiting was appointed as the first nurse at the soon to be constructed health centre. She would be provided with accommodation and would work 9-5 Monday to Friday and 9-1 Saturday for the attractive salary of 273 pounds per annum. The first health centre was officially opened in Eastlake (now Kingston) in July 1927. It consisted of a porch used as a pram parking area, a waiting room and office as well as a bedroom, sitting room and kitchen for the nurse. Not long afterwards, the nurse’s bedroom was adapted to be a feeding room and the sitting room was divided into a new bedroom and sitting room. The early 1930s were difficult for the Society. The Society’s nurse, Sister Lancer, was asked to resign, in part due to her reluctance to visit the clinic in the isolated Molonglo community. A number of departures resulted in a revolving door of Society Presidents. 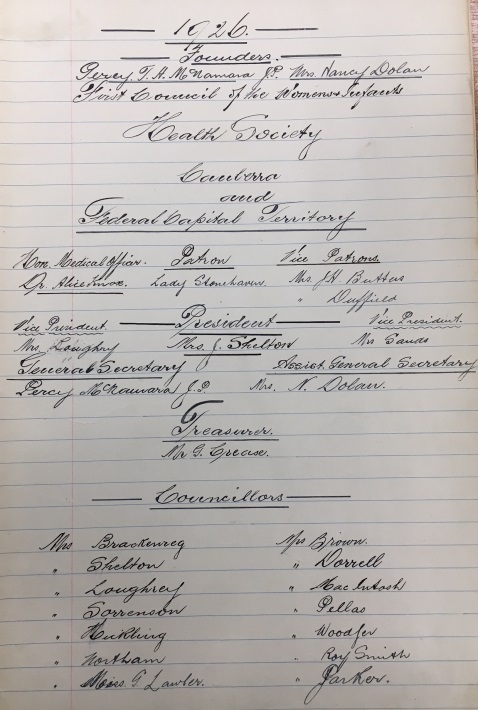 A Special General Meeting was held in 1935, despite the lack of a President or Vice-President. A provisional Council was appointed and Sister Lancer was reinstated. However, by the mid-1930s things were looking up. The Federal Department of Health announced an increased interest in infant welfare in the Territory. This was supported by the Minister for Health, who also happened to be Prime Minister Joseph Lyons, who as a father of 11 children had a keen personal interest. The Society’s annual subsidy grew from 400 to 1000 pounds and a second nurse was employed. Her key duty would be to “visit all homes, district by district, throughout the year and keep in touch with all children from 15 months of age to school age”. 250 pounds was allocated for the purchase of a car to enable visits and two child welfare clinics would be built, one in the north and one in the south. Unfortunately, suitable buildings at the right price were hard to come by and plans for a northside clinic were put on hold. 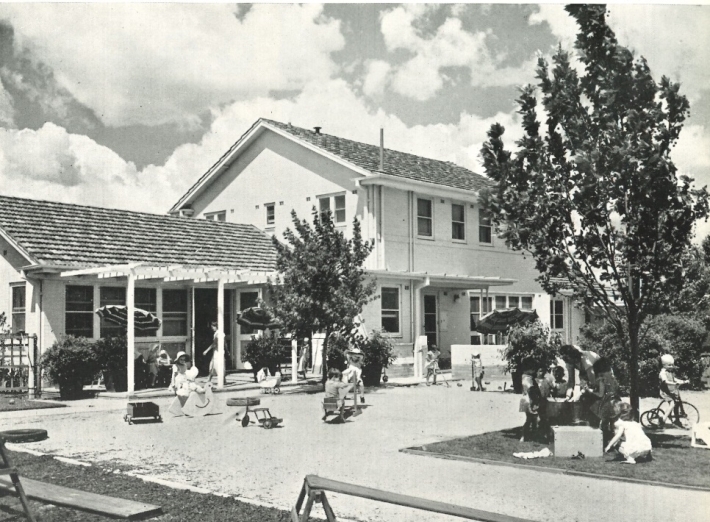 The first permanent Baby Health Centre, known as the Griffith Child Welfare Centre, was opened on the 5th June 1937 and housed a clinic and accommodation for two nurses. The clinic was a great success and soon other sub-clinics were opened at Tharwa, Hall, Westlake and Westridge (now Yarralumla). From June 1937-38 they completed 7,100 examinations of children ranging from newborns to pre-schoolers. Throughout the 1940s, the popularity of the clinics exploded, which isn’t surprising considering the ACT had by far the highest birth rate in Australia from 1946-51, with 41.11 births per 1000 people. However, the conditions at the clinics were not always ideal. At the Ainslie Clinic nurses would have to leave the building to gather kindling for the fire in the nearby park and privacy for breastfeeding had to be sought behind the piano in the hall. Air raid shelters were built at the centres, and the clinics at Braddon and Griffith were used by the Garden Army to grow produce to aid the Red Cross. The nurses took their work very seriously and focused on a wide variety of initiatives including providing in-demand vitamin A and D supplements, promoting breastfeeding, advocating to improve the quality of delivered milk and establishing a library of parenting-related publications. It was a proud fact that every new baby and its mother in the Territory was visited by Sister – and this included trips, complete with scales, over rough unsealed tracks as well as into the relatively remote fastnesses of forestry settlements in the mountains. The Society Council took on a primary role in developing other services throughout the Territory, including a kindergarten program, home assistant’s scheme and baby minder’s scheme. 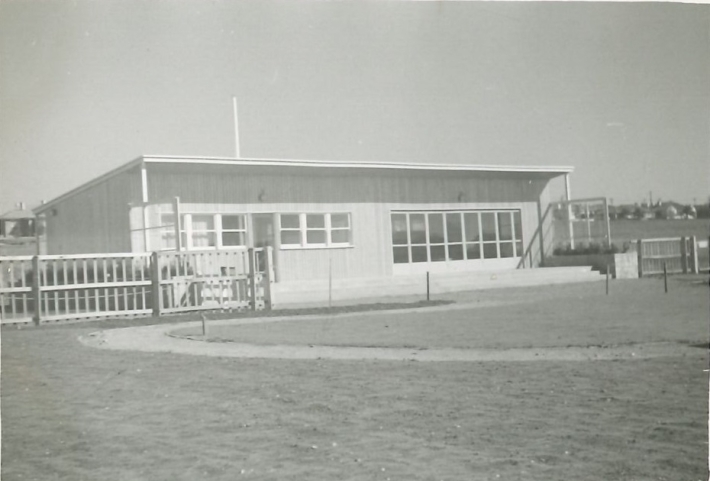 These later became Canberra’s first preschool system, the emergency housekeeper service and occasional child care centres. 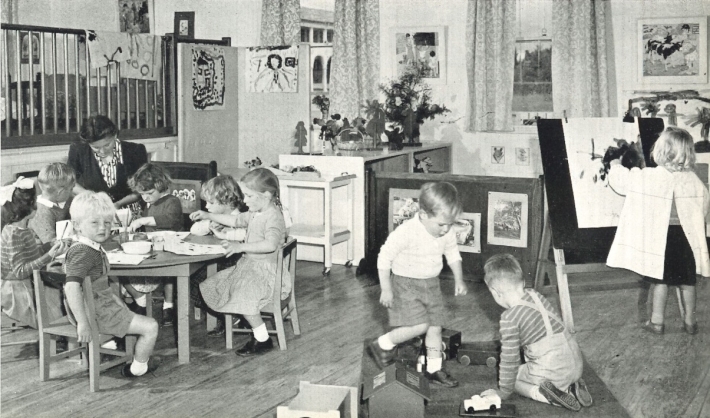 An unofficial kindergarten group ran out of the Griffith Child Welfare Centre in the early 1940s and the Canberra Nursery Kindergarten Society (later the Canberra Pre-School Society) was formed in 1943. 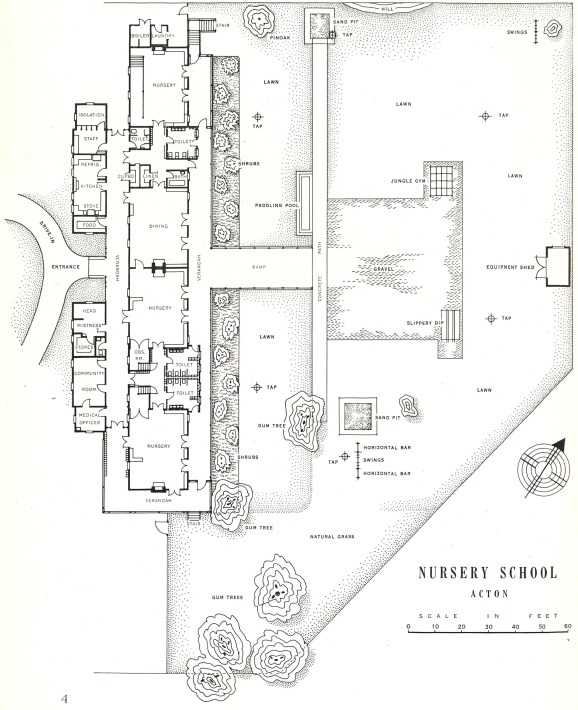 In 1944, the first nursery school was opened in the former isolation ward of the old Canberra Hospital in Acton. Demand greatly outstripped supply and a quota for each district was put in place, with only 92 places for the eligible 804 children. In 1944, the Society lobbied for occasional care centres to assist mothers “who lacked supporting relatives and friends, modern labour-saving domestic appliances, suburban convenience shops and proper transport”. As a result, in January 1948 a combined Baby Health Clinic and Occasional Care Centre was opened in Civic. It was exceptionally well-utilised used and it soon became apparent that a southside centre was desperately needed. Despite the offer in 1945 to use the foyer of Manuka’s Capitol Theatre, it wasn’t until March 1963 that a centre started operating at Manuka (in a more suitable site than the theatre). This was likely of great relief to Sister O’Rorke, who personally provided child-minding for 325 children in 1960 alone. The Emergency Housekeeper Service was fraught with issues, largely a lack of suitable housekeepers and suitable accommodation to house them. Nevertheless, the service operated from the 1940s to the 1960s, providing greatly needed assistance to mothers who were experiencing illness or other crises situations, before responsibility for the service was given to the Red Cross in 1978. It was decided that a home dedicated to post-natal care was of the most pressing need, but this required much negotiation with the Department of Health and the National Capital Development Commission. It wasn’t until 1960 that the government finally agreed to construct a home to be known as the Queen Elizabeth II Coronation Home for Post Natal Care. Disappointingly, the Minister for Health would only agree to provide accommodation for two mothers and their babies, despite protests from the Society. 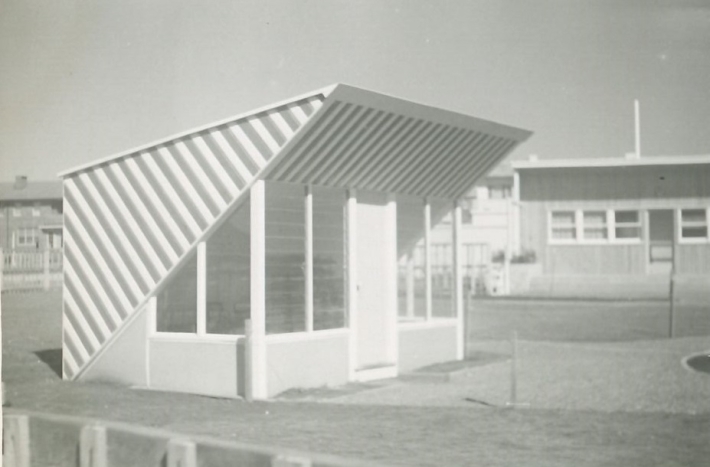 Although slow to get off the ground, the facility grew with the addition of day care services in 1964, available free of charge. By 1970 there was a waiting list for admissions. Additional accommodation was added, as well as space for toddlers and mothercraft nurse training. By the late 1970s, the QEII service employed 45 staff. By the end of the 1960s, the Society operated 32 Baby Health Clinics across Canberra, from Hall to Mawson and Harman to Macquarie. 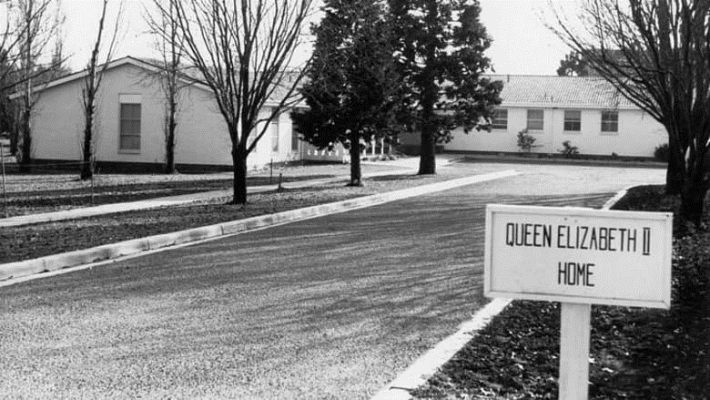 They also operated occasional care centres in the City and Manuka and the popular QEII Home for Post-Natal Care. Since the first clinic opened, almost 40,000 babies had been born in the Territory and mothers made great use of the Society’s services. The modern mother, whether she has her baby in hospital or at home, can still be vulnerable as her own mother was. She may have a washing machine or use the nappy wash instead of having to boil up the old wood or gas copper; she may buy tins of mushy baby food or possess a vitamiser instead of having to push cooked vegetables through a sieve; but she is often isolated and lonely and worried, especially with a first baby; she still has broken sleep and the drag of constant care, and often feels desperately tired; she often needs advice on the minor physical ailments to which small children seem to be prone. However by this time the Society began to feel the strain of managing the number of clinics and in 1969 they asked the ACT Health Services Branch of the Department of Health to take over their management. 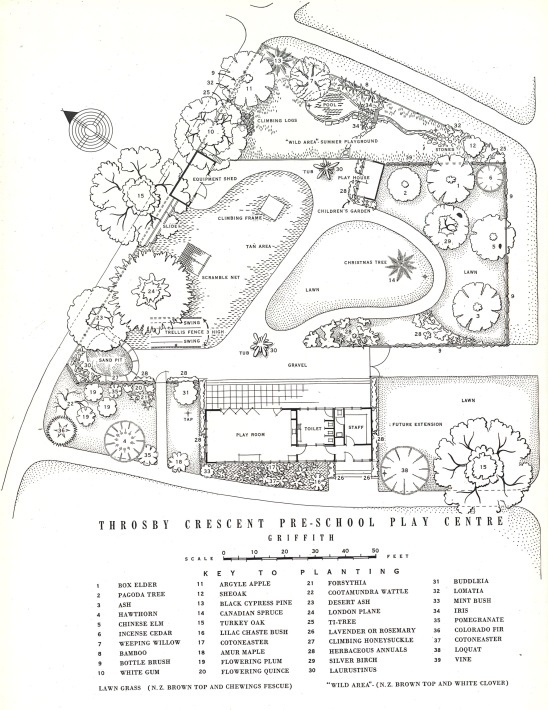 In 1973, the Society was abruptly informed that the management of the occasional care centres at Manuka and Civic would be taken over by the Department of the Capital Territory, who which had plans to establish a number of other centres. The Department argued this would be too burdensome for the Society to manage. Without the responsibility of managing the clinics and occasional care centres, the Society’s focus moved to the QEII Home and other priorities. In the 1980s they established a 24 hour telephone advisory service and in 1997 they oversaw the move of the new QEII Family Centre to Curtin, which celebrated its 50th anniversary in 2013. In recent years the Society has also focused on providing assistance for grandparents. No matter how the Society’s role evolves in the future, they will have left behind a legacy undoubtedly always be that has focused on providing the best support for parents and children in the Territory. Have you ever used any of The Canberra Mothercraft Society’s services?